Written by Stuart Ross and directed by Michael Ross (no relation), “Forever Plaid” is a tribute to the close-harmony "guy groups" like The Four Aces, The Four Freshmen, and other “fours”, that were all the rage in the 1950s. Personifying the clean-cut genre are The Plaids, a quartet whose dreams of recording an album are cut short in a car crash – but get one final chance at musical glory. 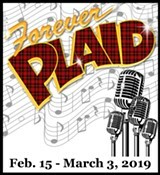 “The Plaids” come back from the afterlife to perform their one-and-only big show.